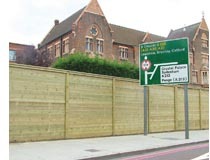 Acoustic fences are the ideal solution to create a noise barrier for reducing noise nuisance. Acoustic fences can be used to screen noise from industrial plants and premises, road noise and railway noise among others and can reduce noise by as much as 28dB without losing the attractive appearance of a good quality wooden fence. Produced using responsibly-sourced FSC or PEFC timber. 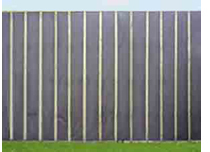 The normal noise barrier (or acoustic fence) incorporates a unique “V” type, close fitting t&g jointing system supported by uniquely designed posts that fix the acoustic fence panels tightly thus eliminating sound leakage through the joints. Regardless of weather conditions the joints will always stay tightly locked. This popular type of acoustic fence is suitable for installations up to 4m high and act as a noise reflector as well as a sound barrier. This is the standard or highway noise barrier but with an extra covering of sound absorption with a weatherproof protective membrane. When applied, the Sound Barrier Extra will improve the acoustic properties of the normal noise barrier fence by an average of 4dB and so can improve an acoustic fence up to 32dB. Sound Barrier Extra is best used on acoustic fences surrounding a noise source. Or for noise sources with ordinary close boarded fences already fixed around them. The Highway Noise Barriers are acoustic fences designed to act as a sound barrier and screen vehicle noise from roads and highways and provide the same level of noise protection as our Normal Noise Barrier. Highway Sound Barrier Fencing has the same unique jointing system as the Standard Noise Barrier and is fixed using galvanised steel ‘I’ Beam posts that give extra strength and can be timber clad to match if required. These acoustic fences meet the Highways Agency standards of BSEN1794-1 and 2 and are also ideal for most installations including those areas subjected to high winds. 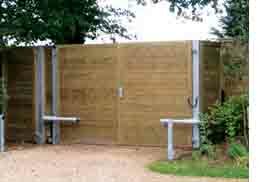 If acoustic gates are required within any of the above fences these can be supplied in either swing or sliding and are available in a range of sizes according to your requirements. We can also automate any gate that is sometimes required to comply with Health and Safety regulations. For more information or technical specifications on any of the above acoustic fences or gates please click on the appropriate link on the top rhs of this page. 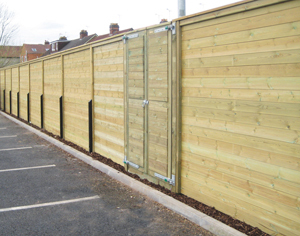 A less efficient 20mm acoustic fence that still utilises a unique “V” type, close fitting t&g jointing system designed for installation where budget may be an issue or where a greater degree of noise screening is not required or where a superficial mass of 12kg/m2 is specified. Due to their lighter construction, Value Sound Barriers cannot be upgraded with the Sound Barrier Extra. Please note the Value Sound Barrier Fencing is not certified.